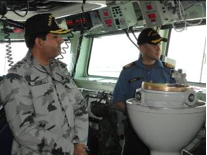 Commodore Asif Khaliq, Pakistan Navy, who is currently the Commander of Combined Task Force (CTF) 150, recently visited the Royal Canadian Navy warship, HMCS TORONTO, whilst she was alongside in Bahrain to learn first-hand about her capabilities. TORONTO, a Halifax-class frigate, is one of the most advanced general purpose platforms in the world and has been actively participating in CTF 150 since Spring 2013, successfully conducting six seizures of illegal drug shipments during the past year. She has been assigned to CMF by the Canadian Government in order to help counter terrorism. In addition the ship and her crew are tasked with encouraging greater regional cooperation, thus setting the conditions for a safe maritime trading environment for all. 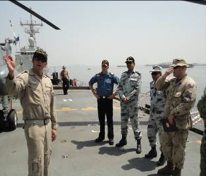 It is also gave Commodore Khaliq an ideal opportunity to appreciate the ship’s dedicated and most capable direct support to CTF 150 in conducting Maritime Security Operations in the area. He added that he has complete confidence in the crew’s professionalism and determination and looks forward to operating with HMCS TORONTO after completion of her visit to Bahrain.